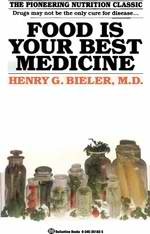 "As a practicing physician for over fifty years, I have reached three basic conclusions as to the cause and cure of disease. This book is about those conclusions. The first is that the primary cause of disease is not germs. Rather, I believe that disease is caused by a toxemia which results in cellular impairment and breakdown, thus paving the way for the multiplication and onslaught of germs. My second conclusion is that in almost all cases the use of drugs in treating patients is harmful. Drugs often cause serious side effects, and sometimes even create new diseases. The dubious benefits they afford the patient are at best temporary. Yet the number of drugs on the market increases geometrically every year as each chemical firm develops its own variation of the compounds. The physician is indeed rare who can be completely aware of the potential danger from the side effects of all of these drugs. My third conclusion is that disease can be cured through the proper use of correct foods. This Statement may sound deceptively simple, but I have arrived at it only after intensive study of a highly complex subject: colloid and endocrine chemistry.